We are delighted to offer a range of cheese platters for any occasion! 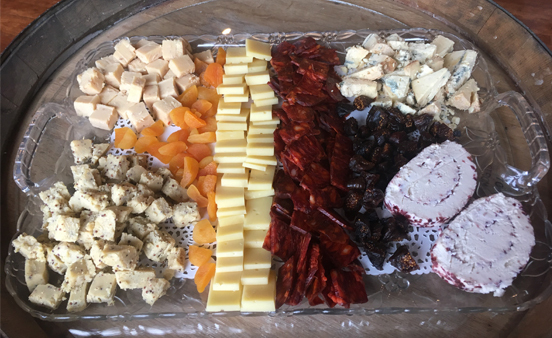 The picture shows a medium size $95 cheese platter (serves up to 25 people) with 5 types of cheese, figs, apricots and salami. We can include other garnishes like fresh fruit, jams, spreads, olives and nuts. All platters come with crackers on the side. We can customize your platter as you desire. to pre-order a custom platter for your special gathering.